Add To Ignore List I have noticed that Shorelines tide tables ( and hence yours ) have not been updated for 2015? Have always used these as the breakdown very handy indeed even though it can vary a bit from other sources. Would be sad if I have to find another source - or rather work out for myself the various splits around the Broads!! Add To Ignore List Hopefully just a temporary glitch or the site is still being worked on. As a tester I entered 31/12/2014 for 60 days and the chart worked fine. It is when you enter the start date in 2015. This being the case I suspect the site is still being updated. 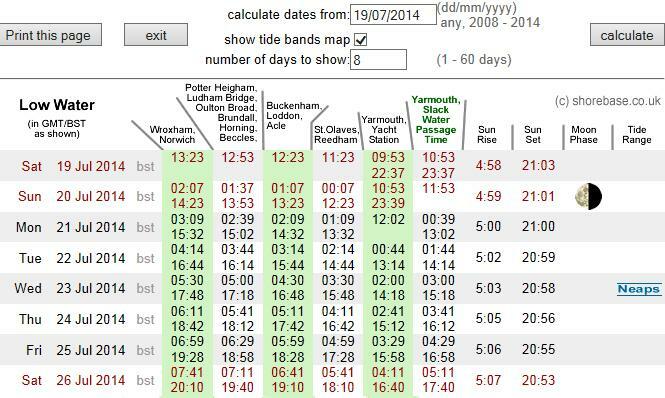 I hope so as it is a brilliant website and tide table chart. The same thing happened a few years back, a quick email to Shorebase had it fixed within a couple of weeks. Unfortunately, I can't find the email address I used. As you say, also very handy for around the Broads in general. This is the e-mail address provided on The shorebase.co.uk website. Have a great holiday. I'm counting the days till the end of September when I pick up Swan Rapture. Add To Ignore List Sorry - ahead of myself! I emailed Paul and his reply was along the lines of "give me a few days to finish off the calculations and the next 5 years timings will be online. Add To Ignore List Great news. Thanks for the update. Add To Ignore List Hi Gary - you OK? Thanks for doing that - I was just going to email him myself so you have saved me one job, but now they will soon be up, I will have a new one organising cruises for 2015!!! Shame; I was going to blame the lack of tide tables....!!!!! Those tide tables are excellent and he does a really good job - he has my grateful thanks at least!